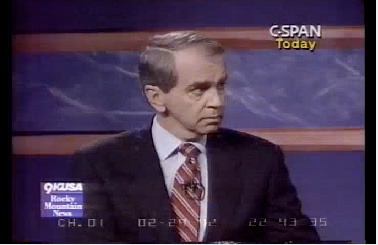 C-Span, as you might have heard, has placed its entire video archive online -- more than 160,000 hours (or 18 ¼ years) of footage, all of it available to everyone free of charge. For committed political dorks (like me), this is a potentially life-altering development. 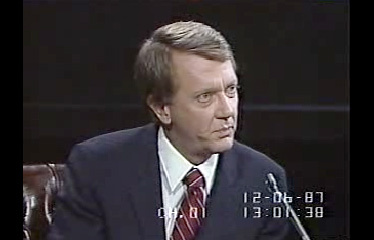 No more futile YouTube searches for clips from the 1990 Weld-Silber Massachusetts gubernatorial debate or from Tom Harkin’s 1992 presidential withdrawal announcement. It’s all here -- and the video and audio quality is (for the most part) remarkably good. Needless to say, I’ve only begun to dive into this trove of nerdly pleasure. 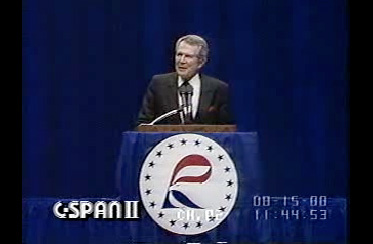 But already, I’ve managed to dredge up five memorable political moments from the fairly distant past. In 1987, Pat Schroeder was on the verge of becoming the first woman ever to launch a full-fledged presidential campaign. She traveled the country, raised money and even participated in an early debate. By the middle of September, she was tied with then-Sen. Al Gore for fourth place in a crowded Democratic field. But the money wasn’t coming in nearly fast enough, and at the end of September, she opted to bow out -- only to choke up as she delivered the news. Her tearful departure became a major story (and the basis for a "Saturday Night Live" impersonation by Nora Dunn) and sparked a debate over sexism in political coverage. 2. "I'm not perfect, but I'm honest." It can be argued that Saturday, Sept. 12, 1987, was the day that the religious right officially took over the Republican Party. It was then that Pat Robertson, the quirky televangelist who'd two years earlier claimed to pray Hurricane Gloria away from New York City, scored a stunning victory in the Iowa straw poll. 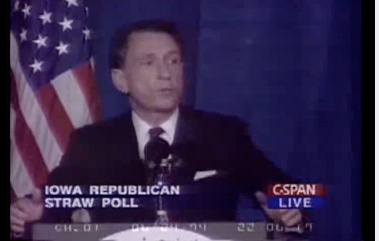 What a setting Arlen Specter chose to unofficially launch his campaign for the 1996 Republican presidential nomination!